What if I am not Catholic? Catholic Relief Serves (CRS) was founded in 1943 to serve the displaced survivors of World War II in Europe, but has since been expanded to reach over 90 countries around the world. Regardless of race, religion or ethnicity, CRS serves those in the greatest need around the world through the spirit of Catholic Social Teaching to better promote the life and dignity of each human person. Campus Ambassadors are selected students with a commitment to social justice and global solidarity who work on their campus to build a constituency for the global poor and advocate for more just policies through CRS. They serve as the official liaison between their campus community and CRS. Campus Ambassadors organize their campus to advocate for social justice issues, serve as the liaison between their campus community and CRS in times of emergency and in regards to global issues, and grow in their own understanding of their faith and its connection to the world around them. 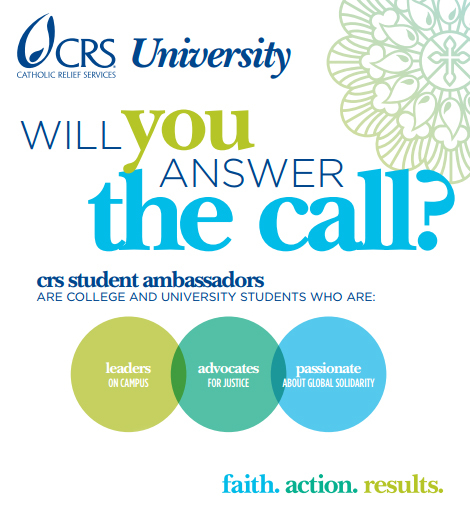 If you would like to learn more about how to apply to become a CRS Campus Ambassador, please contact Frank Bruno at fbruno@sju.edu.